Mammals (class Mammalia) have evolved diverse craniofacial morphology to adapt to a wide range of ecological niches. However, the genetic and developmental mechanisms underlying the diversification of mammalian craniofacial morphology remain largely unknown. In this paper, we focus on the facial length and orofacial clefts of mammals and deduce potential mechanisms that produced diversity in mammalian facial morphology. Small-scale changes in facial morphology from the common ancestor, such as slight changes in facial length and the evolution of the midline cleft in some lineages of bats, could be attributed to heterochrony in facial bone ossification. 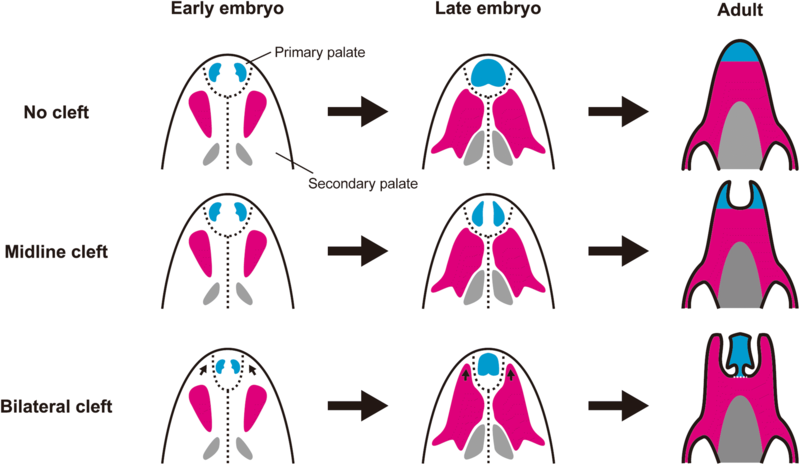 In contrast, large-scale changes of facial morphology from the common ancestor, such as a truncated, widened face as well as the evolution of the bilateral cleft possessed by some bat species, could be brought about by changes in growth and patterning of the facial primordium (the facial processes) at the early stages of embryogenesis. Mammals (class Mammalia) are one of the major groups of vertebrates, containing over 5400 living species as well as abundant extinct species [1–4]. Living mammals consist of three major clades: monotremes (order Monotremata), marsupials (infraclass Marsupialia), and placentals (infraclass Placentalia; Fig. 1). Recent phylogenetics, including comparative phylogenomic studies, have lead to a general consensus concerning the deeper branches of the mammalian evolutionary tree, for example identifying four major clades within placentals: Xenarthra, Afrotheria, Laurasiatheria, and Euarchontoglires [5–11]. Mammals have evolved diverse morphologies to adapt to a wide range of ecological niches [3, 4]. The morphological diversity of mammalian heads is especially remarkable, possibly due to the head’s fundamental role in sensing, communication, and feeding [12–18] (Fig. 1). 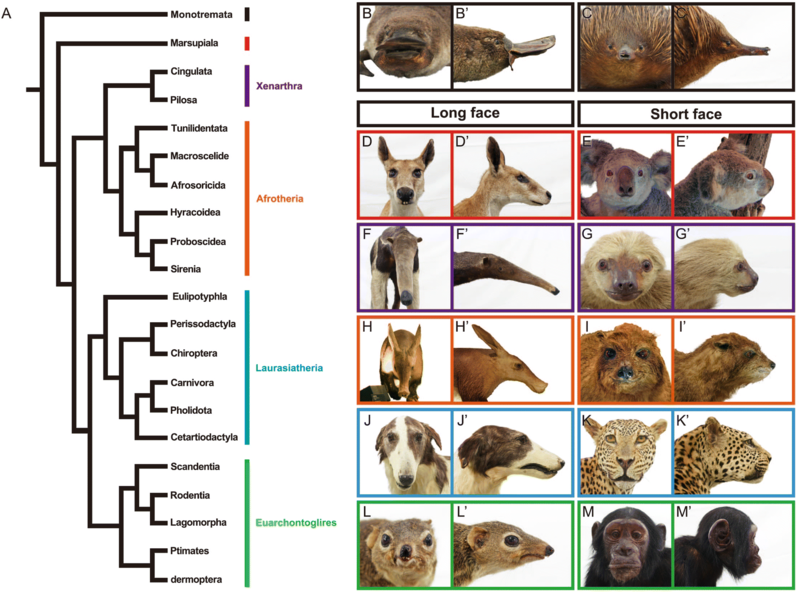 For example, both long- and short-faced taxa are recognized in each mammalian group (Fig. 1). Craniofacial morphology in mammals has been quantitatively evaluated in each group by comparative morphological analyses, including modern geometric morphometrics (summarized in Table 1). However, the genetic and developmental mechanisms underlying the diversification of mammalian craniofacial morphology remain largely unknown. In this review, we compiled the recent findings in the developmental genetics of mice, a model mammalian species, to attempt to deduce the potential diversification mechanisms of mammalian facial morphology. We also introduce the results of previous studies in which a strong correlation between the number of nucleotide tandem repeats within the Runx2 gene and the facial length in some placental mammals was reported. 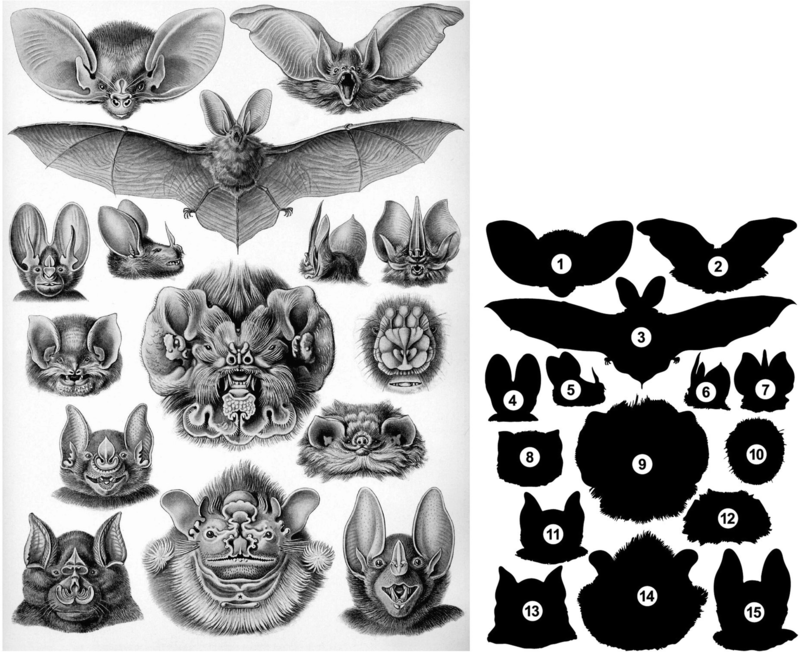 Finally, we focus on bats (order Chiroptera), which display a substantial degree of craniofacial diversity and discuss their potential as a model for understanding the evolution of mammalian craniofacial morphology. Mouse transgenesis is a powerful tool to infer the function of genes related to vertebrate morphogenesis. We examine the phenotypes of transgenic mice to gain insights into the molecular and cellular mechanisms that produce morphological variation in mammalian faces. We focused on two developmental events: (1) growth and patterning of the facial primordium and (2) ossification of the facial bones that lead to a shortened face and the orofacial cleft (Table 2). Formation of mammalian faces begins at the pharyngula stage of embryogenesis, through growth and fusion of the five facial processes: the frontonasal process (FNP), medial nasal processes (MNPs), lateral nasal processes (LNPs), maxillary processes (MAXs), and mandibular processes (MANs) . In the facial development of mice, FNP first expands anteriorly in a nine-day-old embryo (E9.0). Subsequently, MNPs and LNPs start to bulge out from the FNP at E10.0. These two processes surround the nasal placodes, MNP surrounds its medial aspect, and LNP surrounds its lateral aspect. During the same embryonic stage, MAXs begin to bulge anteriorly covering the ventrolateral aspect of the FNP. MAXs and the FNP continue to grow and fuse to each other in later stages to form the upper jaw. Paired MANs begin to grow anteriorly at E9.0 and fuse to one another at the midline to form the mandible [19, 20]. The early patterning of the mammalian face is regulated by migration and proliferation of the neural crest-derived mesenchyme (ectomesenchyme hereafter) [19, 21]. Mice with genetic defects related to the migration or proliferation of the ectomesenchyme possess a shortened face [22–25] and/or cleft lip (CL) occasionally accompanying the cleft palate (CP) [19, 26–28]. Several major signaling pathways, including BMP, FGF, Shh, and Wnt signaling pathways, are associated with outgrowth and fusion of the facial processes . Repression of the up-stream component genes of these signaling pathways (e.g., Bmp4, Fgf8, Shh, and Wnt3) leads to a truncated face [19, 22, 24, 29, 30]. Recent papers have reported that migration of ectomesenchyme in the heads of mouse embryos are directly regulated by Wnt5a, a ligand of non-canonical Wnt signaling pathway [22, 25, 31, 32]. Alteration of the level of neural crest-specific Wnt5a expression (by both knockout and over-expression) results in a widened, shortened face [25, 33]. In Wnt5a conditional knockout mice, the migration pattern of the ectomesenchyme that later occupies the internal space of the facial processes is altered from that in control wild type mice . The change in the ectomesenchyme migration pattern was attributed to the disruption of the directionality of cell division . The induction of the internal facial structures (e.g., cartilage, bones, sensory compartments, muscles, glands, and teeth) was not influenced, and the lower jaw’s volume in the Wnt5a conditional knockout mouse was almost equivalent to that of the control mouse . These results suggest that Wnt5a could play a crucial role in generating a shortened, widened face (truncated face) as naturally seen in koalas, sloths, the great apes, and cats through regulating the ectomesenchyme’s migration pattern, which in turn governs growth and organization of the facial processes (Fig. 1). Disruptions in the growth and fusion of the facial processes also cause CL with or without CP (collectively called ‘CL/P’) [26–28]. A fusion of the facial processes first occurs between LNP and MNP, followed by a fusion of LNP and MAX. Finally, the anterior ends of both MAX and MNP are fused to one another. Fusion of the facial processes is initiated by contact of the epithelium of each facial process through proper organization of the facial processes . Subsequently, the epithelial seam between coadjacent facial processes disappears due to apoptosis. Fusion of the MNP and the MAX and fusion of the MNP and the LNP are defective in mutants of the genes (e.g., Bmp4, Bmpr1a, Tcfap2a, Sox11, and Wnt9b) that regulate apoptosis within the epithelium as well as outgrowth and organization of the facial processes. Failure of these facial processes fusing accompanies CL/P . The palate of mammals separates the oral cavity from the nasal cavity and is subdivided into the anterior bony hard palate (palatal bones) and posterior soft palate . The formation of the palate (palatogenesis) proceeds in two steps, the primary and secondary palate formations. In mouse development, the primary palate is formed by the fusion of the MAXs and MNPs at E11.5. Subsequently, the secondary palate is formed through three consecutive events. First, a pair of palatal shelves is formed by an uplift of the tongue at E11.5. Second, at E14.5, each palatal shelf grows medially above the tongue through ‘palatal shelf elevation’ . Third, the left and right palatal shelves meet and fuse at the midline at E15.0 with fusion completing at E17.0. Palatal bones (anterior premaxilla derived from the ectomesenchyme of the primary palate, and central maxilla and posterior palatine that are derived from the ectomesenchyme of the secondary palate) begin to form at E14.5. In contrast to defects in facial process development that produce an extremely shortened face (see the previous section), defects in facial bone formation, which occur in later phases of facial development, lead to a shortened face with milder dysmorphology. For example, Fbln5 knockout mice exhibit decreased outgrowth of the premaxilla bones during postnatal stages, compared to control wild type mice . Fibulin-5 is an extracellular matrix protein deposited as a fibrous matrix in neural crest-derived craniofacial suture mesenchyme and plays a role as a regulator of cellular function such as cell proliferation [35, 36]. While premaxilla-maxilla suture mesenchyme in Fbln5 knockout mice were capable of differentiating into osteoblasts, suture cells in the mutant were less proliferative, suggesting fibulin-5 is indispensable for the regulation of facial suture mesenchymal cell proliferation required for craniofacial skeletal morphogenesis . External facial morphology of adult Fbln5 knockout mice is almost normal, although facial length is slightly shortened compared to the control . Defected facial bone development also leads to a submucous cleft palate (SMCP). SMCP is a clinical subgroup of CP. While CP is characterized by the whole palate (including both bones and epithelium) separated at the midline, SMCP is characterized by incomplete fusion of left and right palatal bones at the midline without cleft formation in the oral epithelium covering the bones. In mouse transgenesis, SMCP is only observed in the region between left and right maxilla bones. Only two genes that cause SMCP have been reported to date, Bmpr1a and Tbx22. In Osr2-IresCre;Bmpr1a f/f transgenic mice, Bmpr1a was specifically knocked out in the tissue constructing the secondary palate. Osr2, whose promoter sequence was used for tissue/time-specific Bmpr1a knockout, is uniquely expressed in secondary palate morphogenesis in mice (see  for detail). The tissue-specific inactivation of Bmpr1a causes reduction of mesenchymal condensation in the anterior part of the secondary palate which subsequently differentiates into the maxilla bones . Expression of Runx2, Osterix, and Dlx5, genes encoding transcriptional factors for bone development, is severely down-regulated in the anteromedial part of the secondary palate of Osr2-IresCre;Bmpr1a f/f transgenic mice. As a result, elongation of the maxilla bones toward the midline is blocked, resulting in a cleft between the left and right maxilla bones . Tbx22 is a transcription factor required for palatal bone formation . Tbx22 knockout embryos bear a CP or SMCP accompanied by delayed osteoblast differentiation and hypotrophic maxilla bones . To our knowledge, elongation of the face in transgenic mice compared to wild type mice has not been reported to date. In fish and birds, longer and more pointed jaws or beaks are formed by up-regulation of calmodulin signaling [40–43]. In mammals, however, the function of calmodulin signaling in facial development is poorly understood. Runx2 may regulate facial length in mammals. We briefly review the correlation between facial length and the variation of glutamine/alanine tandem repeats within Runx2 in the next section. There are long- and short-faced taxa in each mammalian group, and both face types show a high degree of diversity and evolvability in facial length (Fig. 1). Runx2 (Runt-related transcription factor 2) is an important transcription factor protein that plays multiple roles in bone development (e.g., osteoblast differentiation) in vertebrates including mammals [44–46] (reviewed in ). Runx2 enhances early osteoblast differentiation but inhibits terminal osteoblast differentiation . Therefore, up-regulation of Runx2 leads to accelerated (via early onset of osteoblast differentiation) and extended (via delayed termination of osteoblast differentiation) bone development, while down-regulation of Runx2 results in delayed, shortened bone development [48, 49]. The Runx2 protein contains a highly conserved RUNT DNA binding domain and a repetitive glutamine (Q) and alanine (A) domain [46, 50]. Changes to the tandem repeat glutamines to alanines ratio (QA ratio), calculated by dividing the number of consecutive glutamines by the number of consecutive alanines within Runx2, alter transcriptional activity of Runx2 and its target genes [49, 51]. The Runx2 QA tandem repeat ratio is correlated with facial length variation in carnivorans [49, 52, 53]. Species with higher QA ratios have longer faces  (Fig. 2). In contrast, a lower QA ratio leads to lower transcriptional activity of Runx2 and results in short-faced carnivorans  (Fig. 2). This suggests that the QA ratio is associated with allometric variation in carnivoran facial length and the timing of facial bone (e.g., premaxilla, maxilla, nasal, jugal, vomer, palatine, and dentary) ossification. A similar pattern has been reported in primates . Conversely, there is no correlation between the Runx2 QA tandem repeat ratio and facial length in xenarthrans and afrotherians , and marsupials . Although marsupials display variation in facial length roughly equivalent to that observed in placentals (Fig. 1), almost no variation is observed in the nucleotide sequence of glutamine/alanine repeats in Runx2 . The extreme conservation of nucleotide sequence and the QA ratio in marsupials may heavily constrain the timing of facial bone ossification in marsupial species . These results suggest that the variations of facial length in xenarthrans, afrotherians, and marsupials are brought about by distinct molecular mechanisms. For example, a missense mutation in the gene Bmp3 (that encodes a growth factor, Bone morphogenetic protein 3) causes brachycephaly (shortened head) in domestic dogs . We recommend further research concerning the role of morphogenetic genes such as Bmp3 to improve our understanding of the mechanisms generating facial length variation in mammals other than carnivorans and primates. As reviewed in section II, our understanding of mammalian facial development mechanisms has been informed by studies of laboratory mice. However, the developmental mechanisms that produce facial morphology in non-model, wild mammal species have been only partially understood, perhaps due to difficulties in obtaining embryonic materials for analyses. More is understood about the molecular and cellular mechanisms underlying diversification of facial (beak) morphology in non-model bird species thanks to a series of evo-devo studies of Darwin’s finches, one of the most famous examples of adaptive radiations in vertebrates [40, 57–62]. Although model mammals help us to understand the basic mechanisms of mammalian morphogenesis, studying non-model species is necessary to identify other molecular and cellular mechanisms that lead to the morphological evolution of this group of vertebrates (including humans). Here, we focus on bats as a potential model for understanding evolution of mammalian craniofacial morphology. Bats (order Chiroptera) are the second largest group of mammals after rodents [2, 63]. More than 1300 extant bat species are known, classified into 20 families . Recent molecular phylogenetic studies [64–67] identified two major clades within bats, the Yinpterochiroptera and Yangochiroptera (Fig. 3). Chiropterans are distributed worldwide in all but the coldest regions , probably facilitated by the evolution of flight [68–80]. Although largely neglected by biologists, diversity in bat facial morphology is astonishing. This diversity reflects their adaption to various environments and highly impressed Ernst Haeckel, an influential comparative embryologist and an artist in nineteenth century  (Fig. 4). New World leaf-nosed bats (family Phyllostomidae) are especially known for their incredible facial diversity [82, 83]. Phyllostmid facial length is strongly correlated with diet [84–86]. For example, frugivorous species (e.g., the wrinkle-faced bat, Centurio senex) have a truncated, widened face that exerts a high bite force. In contrast, nectarivorous species (e.g., the mexican long-tongued bat, Choeronycteris mexicana) have a long, narrow face that helps them to insert their rostrum into flowers. However, the molecular and cellular mechanisms that regulate the facial length of bats and are responsible for generating existing diversity in craniofacial morphology are poorly understood. Bats have a unique morphological feature in the rostral part of the upper jaw, an orofacial cleft on the premaxilla and maxilla bones that is anatomically similar to that observed in humans with congenital anomalies [87, 88]. There are two types of chiropteran orofacial cleft, midline and bilateral clefts. The midline cleft is observed in nine families of bats: Megadermatidae, Emballonuridae, Molossidae, Miniopteridae, Vespertilliionidae, Cistugidae, Myzopodidae, Thyropteridae, Furipteridae  (Fig. 3). Midline clefts are U-shaped clefts present between two premaxilla bones that are highly reduced in size (Fig. 6). Each premaxilla bone bears two permanent incisors and is completely fused to the maxilla bone posteriorly. The inner space of the cleft is occupied with a robust, translucent, fibrous membrane. The bilateral cleft is only seen in Rhinolophidae and Hipposideridae  (Fig. 3). In this cleft type, the premaxilla bone, which bears a single diminutive incisor, is separated from the laterally located maxilla bone by a cleft. The cleft is filled with fibrous connective tissue. The posterior margin of the medially fused premaxilla bones is loosely connected to the maxilla bones with fibrous connective tissue. Bat orofacial clefts may contribute to reduction of returning echolocation signal interference, modulation of nasal acoustic emissions, increasing oral gape to facilitate capture of large prey, reduction of overall weight, and increase of olfactory ability . However, the molecular and cellular mechanisms underlying orofacial cleft development in bats and the degree to which development of the two cleft types is similar are currently unknown. Few studies have investigated the molecular mechanisms related to craniofacial diversity in bats. One such study by Phillips et al. focused on Pax9, a transcription factor that plays an important role in vertebrate craniofacial and dental development. The authors compared nucleotide sequences of the 3′ untranslated region (UTR) of Pax9 among phyllostomids, vespertilionids, and other mammalian orders and identified four Musashi-binding elements (MBE) within conserved regions of the 3′ UTR . The number of MBEs in morphologically diverse phyllostomid bats varied but was invariant in morphologically similar vespertilionid bats with the exception of a Murina species . Because the number of MBEs may affect the expression level of Pax9, the authors proposed that the evolution of Pax9 regulation may be a contributing mechanism to the radiation of craniofacial morphological diversity in bats . 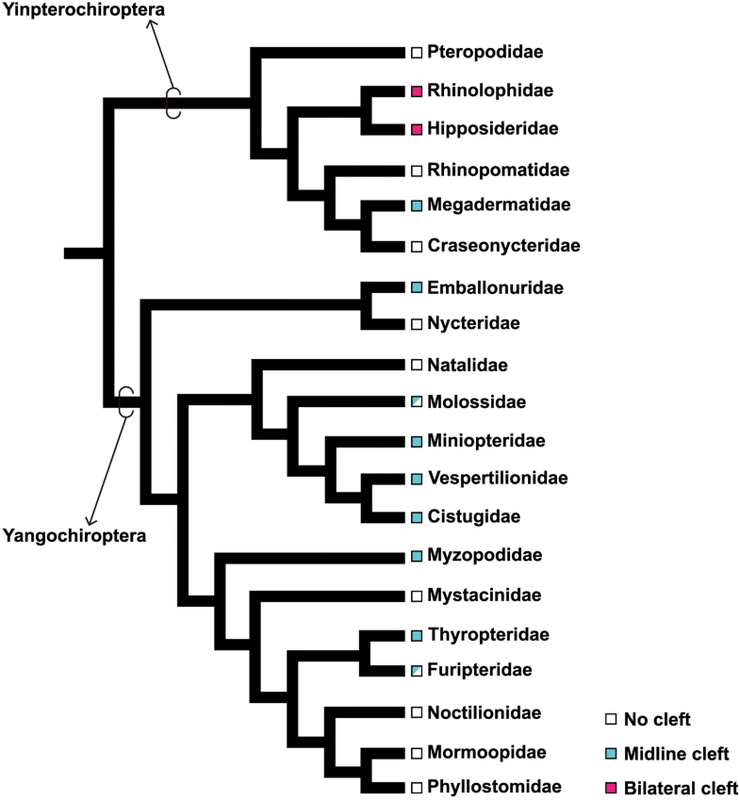 Although this study provides valuable insight into a potential genetic mechanism underlying the evolution and diversification of craniofacial morphology in phyllostomid bats, our understanding of the fundamental facial development mechanisms is far from complete. Because convergence or parallel evolution of morphological traits in vertebrates is often brought about by identical genetic mechanisms (e.g., [90–93]), common mechanisms might regulate facial length even in bats (superorder Laurasiatheria) and rodents (superorder Euarchontoglires; Table 2). In mice, a shortened face without apparent facial bone defects is mainly brought about by a decrease in proliferation and differentiation of the ectomesenchyme which later differentiates into osteoblasts . In addition, facial length variation observed in carnivorans and primates are correlated with the level of activity of Runx2, which influences facial bone development duration . Therefore, facial length variation in bats could be attributed to differences in the duration of facial bone development among species. For example, nectarivorous bats (e.g., Choeronycteris mexicana) have a relatively longer face. In this case, the duration of facial bone development might be extended, giving facial bones time to enlarged, especially anteriorly (Fig. 5). Conversely, insectivorous or omnivorous bats (e.g., Macrophyllum macrophyllum) have a relatively shorter face. Here, the period of facial bone development may be shortened leading to earlier completion of facial bone growth and preventing further anterior elongation (Fig. 5). Indeed, heterochronic shift in formation and growth of the palatal bones may produce variations of craniofacial morphology in phyllostomid bats . Sears supposed that the diversity of palate shapes along phyllostomids is the result of relatively subtle evolutionary changes in later rather than earlier developmental event. Although it is likely that Runx2 plays a crucial role in producing facial length diversity in carnivorans and primates [49, 52–54], its function in chiropteran craniofacial development has yet to be identified and warrants further investigations. The truncated face of Wnt5a conditional knockout mice is brought about by the disruption of ectomesenchyme migration within the facial processes . Notably, some phyllostomid bats (e.g., Centurio senex) possess an extremely truncated face that shares multiple characteristics with Wnt5a knockout mice faces. Therefore, facial morphology in these bat species might be derived from changes in expression of the genes that control direction of migration of the ectomesenchyme through regulating the directionality of cell division within the facial processes (Fig. 5). It would be interesting to compare Wnt5a activity and expression pattern in facial ectomesenchyme among chiropteran species. The orofacial clefts observed in bats are morphologically categorized as SMCP. They are probably brought about by changes in premaxilla and maxilla bone formation. As we introduced in section II, Osr2-IresCre;Bmpr1a f/f mice have a cleft between paired maxilla bones . If Bmpr1a expression is specifically inactivated in the primary palate region using a similar transgenic technique (e.g., using a promoter of the gene that is uniquely expressed in the primary palate in gene knockout), a cleft may appear between paired premaxilla bones that are derived from the ectomesenchyme distributed within the primary palate. Considering this, the midline cleft in bats, which is present between two premaxilla bones, could be explained by domain-specific repression or down-regulation of Bmpr1a in the ectomesenchyme within the primary palate (instead of the secondary palate) that later gives rise to the premaxilla bones (Fig. 6). Because Bmpr1a is a receptor of the growth factor, the down-regulation of Bmpr1a may decrease the degree of ossification of the premaxilla bone through heterochrony (shorter and/or delayed ossification of the bone compared to the ancestor) and may result in such a small-scale morphological change in the tip of the face. The formation of the bilateral cleft could be much more complicated, perhaps associated with extensive alterations of the developmental program. The premaxilla bones are derived from the ectomesenchyme distributed within the primordium of the primary palate, while the maxilla bones are derived from that of the secondary palate. Therefore, in the facial development of bat species bearing the bilateral cleft, the relative position of the primary and secondary palates might be changed through alterations in formation and organization of the facial processes from those in bat species without orofacial cleft. We speculate that the bilateral cleft developed through the following three steps (Fig. 6). First, the ectomesenchyme occupying the secondary palate expanded its distribution antero-medially and restricted the space for primary palate development at the tip of the face. Second, the osteoblasts derived from the ectomesenchyme distributed within the anterior part of the secondary palate differentiated into bone and made anterior projection of the maxilla bones surrounding the premaxilla bone laterally. Thus, the position of the premaxilla bone became restricted at the center of the tip of the face. Third, inhibition of ossification at the suture between the medially positioned premaxilla and laterally positioned maxilla bones left the unossified area between the two bones as a cleft. Orofacial clefts occur as a craniofacial anomaly in humans at a relatively high frequency (approximately 1 in 700 live births) . Investigating the mechanisms behind orofacial cleft formation in bats may contribute not only to understanding the reason why this cranial feature, which usually occurs as a skeletal pathology in other mammals groups including humans, appears as a normal phenotype in bats, but also to developing novel therapies against human orofacial cleft. In the last 15 years, several studies have described in detail the overall embryonic development [95–100] and specifically wing development of bat species where embryos could be obtained [68–77, 79, 80]. We believe that examination of bat facial development and its comparisons among the species provide profound insights into the molecular and cellular bases of craniofacial morphology diversification in mammals. In this paper, we have reviewed recent advances in understanding how mammalian faces are formed and discussed how these data are being applied to make new hypotheses about the diversity creation in mammalian craniofacial morphology. Small-scale changes in facial morphology from the ancestor, such slight changes in facial length and the evolution of the midline cleft in some lineages of bats could be attributed to heterochrony in facial bone ossification. In contrast, large-scale changes in facial morphology from the ancestor, such as a truncated, widened faces, as well as the evolution of the bilateral cleft in some bat species, could be brought about by changes in growth and patterning of the facial primordium (the facial processes) at the early stages of embryogenesis. Significant work remains to be done to test these hypotheses. All authors contributed to the writing and editing of the manuscript. Both authors read and approved the final manuscript. We thank Dr. Shin-ichiro Kawada (National Museum of Nature and Science, Tokyo) and Dr. Hiroko Kudo-Hirotani (Kanagawa Prefectural Museum of Natural History) for arrangement of the stuffed specimens of mammals, Mr. Jason Preble for proofreading the early version of the manuscript, and all members of the laboratory of Vertebrate Diversity and Evolution, Toho University for helpful discussions.